She’s a Trump loyalist. He thinks Trump is a threat to democracy. Journalist Ben Terris asks the Conways the question that has consumed Washington gossip: What’s up with that? It’s a picture he took on election night 2016: Donald Trump is reaching for the first draft of his acceptance speech, just as victory seems imminent. Back then, George was such an ardent supporter of the president, and so proud of his wife for her historic role as campaign manager, that he wept for joy. The $7.7 million Mediterranean revivalist, with its terra-cotta roof and three-story turret, looks like a mini Mar-a-Lago. Clocking in at 15,000 square feet, it gives the Conways room for their four children, two corgis, and art collection, with plenty of space left over for the kind of dinner parties typical in this tony neighborhood off Embassy Row. We’re in the woods, chugging up a steep incline. We’re in Georgetown going on and off the sidewalk, and on and off the record. We’re in Tenleytown, weaving through the sideways glances of lookie-loos, then power-walking through Glover Park. And she talks, about any and everything: issues with her father (he left when she was 3), feminists (the funny thing, she says, is she’s living the life they claim to want), and her thoughts on the administration’s practice, since reversed, of having federal agents separate migrant families at the border (she didn’t like it, she says, but that wasn’t the president’s fault). Kellyanne remembers how encouraging George was of that independence when they first got married 17 years ago. Back then, Kellyanne was just finding her footing as a sought-after pollster in Washington. She remembers one of George’s friends telling him that the best thing for their marriage would be for her to shut down her business—the company she built from scratch—and how George, even though he made enough money himself to support the family, encouraged her to keep working toward her own dream. Naturally, though, the two things overlap. When George criticizes the president publicly, Kellyanne says, the media coverage and the implication that they are pitted against each other bothers their children. And as for the president himself, Kellyanne won’t say it irks him, but she does think he finds it “impolite.” On that, she’d agree. After our 6-mile journey, it is late when we get back to their house. George is in his office, eating a bowl of cereal and yawning. He’s too tired for an interview at the moment, he says. He’s never done an interview on his thoughts on Trump, preferring to let the tweets speak for themselves. There’s a theory among D.C. Trumpologists that this is all a charade. A way for the Conways to be part of both the Trump White House and the Trump-leery establishment. They live in a part of the city where wealth and influence serve as a cooling balm for the partisan inflammation that has spread elsewhere. In their neighborhood, everybody—Democrat and Republican—belongs to the garden party. Here, a husband subtweeting his wife’s boss may seem less an act of moral courage than a juicy gossip item, or possibly a way for the family to hedge its bets. It’s three days after the house tour, and we’re in Ventnor City, N.J., just a boardwalk away from Atlantic City, at George and Kellyanne’s beach house. Kellyanne bought this house back in the late ’90s, when she was single and just starting to make good money. She picked this spot because it felt like home; her mother had been employed at a casino nearby for more than 20 years and still lives in the house where she raised Kellyanne less than an hour away. The beach house also happens to be right down the road from Trump’s old Taj Mahal resort and casino. George isn’t from around here. He grew up in Massachusetts, a contrarian since, as a child, he decided to root for the Yankees instead of the Red Sox. By the time he was 30 he was a hotshot lawyer, a partner at a big-time law firm in New York City. While there, George fell into a clutch of Republicans secretly working behind the scenes to lay the groundwork for Bill Clinton’s impeachment. It wasn’t his day job, just a hobby, but one that got him a lot of attention. 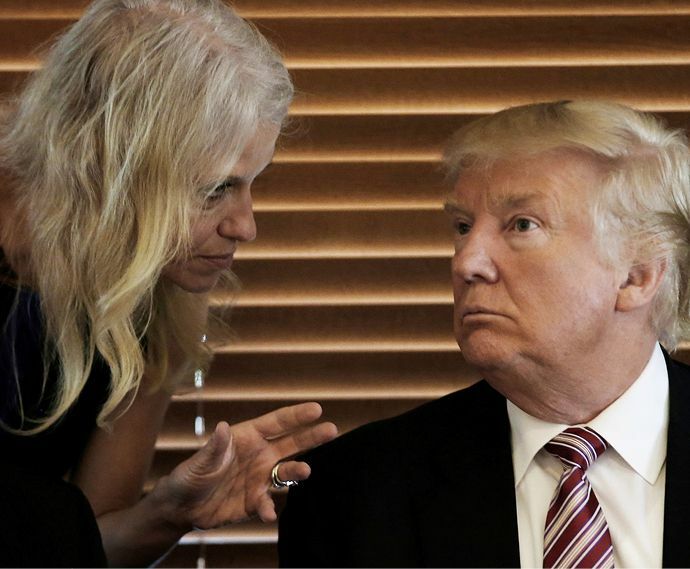 One of his friends from that time, Ann Coulter, introduced him to Kellyanne. Shortly after getting married in 2001, Kellyanne and George moved into an apartment in Manhattan’s Trump World Tower. There, George made an impression on the future president at a condo board meeting where he argued against removing Trump’s name from the building. The speech earned George an offer to join the condo board, which he declined but passed on to his wife, who accepted. Nevertheless, George liked Trump well enough for a time that he considered joining his administration, with a top role in the Justice Department. But his pre-nomination process coincided with Trump firing FBI Director James Comey, and the beginning of the Mueller investigation. Instead, George immersed himself in the small fraternity of anti-Trump conservatives. He is now a man without a party: In early May of this year, George changed his affiliation from Republican to “unaffiliated.” He has, according to Politico.com, offered unsolicited advice to journalists who have written articles critical of the president. And recently, he has been spotted at a semisecret group of Trump skeptics known as the Meeting of the Concerned, eviscerating his wife’s boss among fellow conservatives who would like to see Trump, and by extension Kellyanne, out of a job. If he’s being honest, that would make George happy too. On their last full day together at the beach, George is in the kitchen with his wife by his side. Tomorrow this house will be set up for Face the Nation, after which Kellyanne will be swarmed on the street by fans while George watches the second half of the show—the part where pundits analyze his wife’s interview—alone in the kitchen. But for now, things feel almost like they used to be. This is what George misses at times, his simpler life. He starts to open up about his tweets. Kellyanne is cutting vegetables 10 feet away with a longtime friend. The women start singing “The Glory of Love,” a central song in the weepy movie Beaches, which also took place on the Jersey Shore and is about two childhood best friends. “It’s an outlet—that keeps it a small part of my life,” George says of his tweeting. You’ve got to win a little / Lose a little / And always have the blues a little. You’ve got to give a little / Take a little / And let your poor heart break a little. That’s the story of / That’s the glory of love.